About the size of a standard thumbdrive, the second-generation AirStash comes with a clever trick up its sleeves: the ability to wirelessly share your videos, photos, music, and other documents with an iPhone, iPad, or just about any Wi-Fi-enabled gadget with a web browser. Slated to go on sale next month, the Maxell AirStash A02 ($149 with a bundled 8 GB memory card, or $179 with a 16 GB memory card) is smaller, faster, and—unfortunately—somewhat pricier than its $99 predecessor. 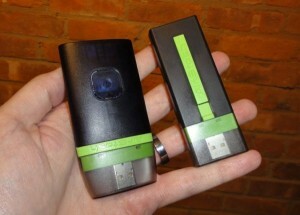 The new AirStash (right) is somewhat smaller—and pricier—than its predecessor (left). Here’s how it works. First, you take a memory card (either an SD card of your own, or the one that comes with the AirStash), load it with movies, music, photos, or other documents, and then slide the card into the AirStash’s memory-card slot. Next, you turn on the three-ounce AirStash (just press and hold the power button until an indicator light starts flashing), connect your iPhone, iPad, or Android device to the AirStash’s Wi-Fi signal, and type “airstash.net” into your mobile web browser. 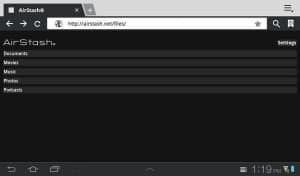 If all goes well, you’ll arrive at a polished website that lets you browse and access the files sitting on your portable AirStash drive. 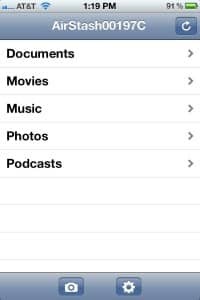 For example, just tap “Movies” to see the videos on the AirStash’s memory card, and tap the title of a file to begin playing it immediately; same goes with songs, photos, PDFs, and other documents. The AirStash's web interface, as seen on an Android tablet. Up to eight Wi-Fi-enabled gadgets can connect to the AirStash at once, and up to three users can stream videos on the AirStash simultaneously. You can also tap into the rechargeable drive using a slick (and free) app for the iPhone, iPad, or iPod Touch. The AirStash may come in particularly handy for photographers who want to wirelessly transfer snapshots from their digital cameras to the iPhone or iPad—neither of which have slots for removable memory cards. Just snap some photos, remove the SD memory card from your camera, insert it into the AirStash, and import your photos (either individually or in batches) to the Camera Roll of your iDevice. 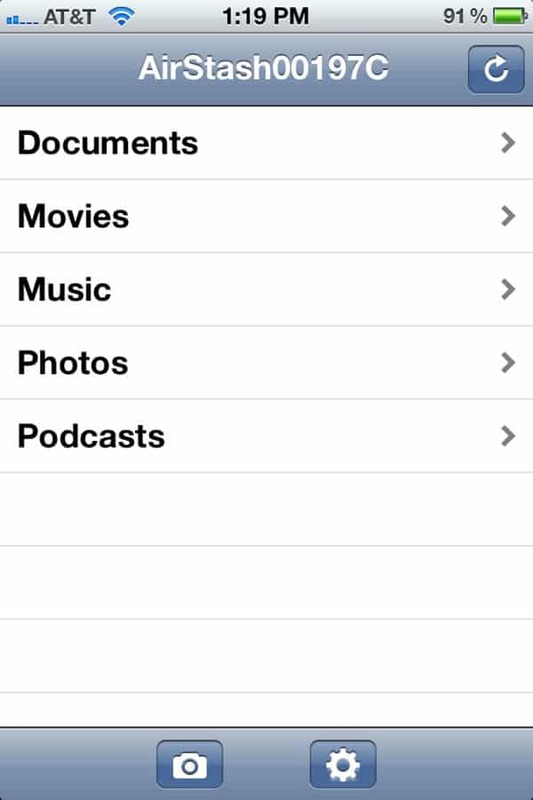 The AirStash's iOS interface in action. It’s a neat trick, but there’s a downside: you can’t access the Internet on your iPhone, iPad, or other smartphone or tablet while it’s connected to the AirStash’s Wi-Fi signal. Why? 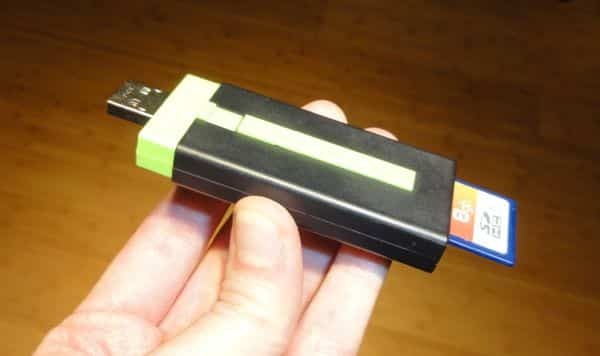 Because while the AirStash will let you stream anything stored on its plugged-in memory card, it’s not connected to the Internet itself. Now, to be clear, there are other portable, wireless hard drives that connect to smartphones and gadgets, such as the GoFlex Satellite from Seagate. 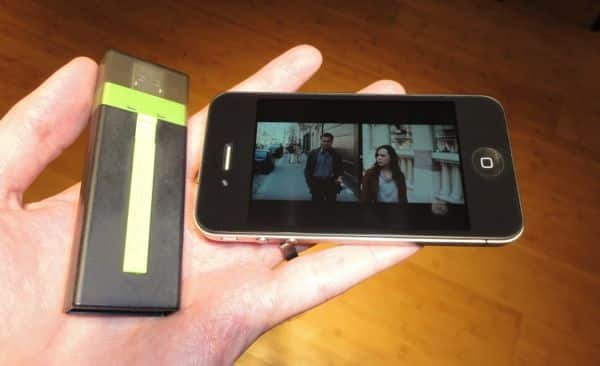 But while the half-pound GoFlex boasts a massive 500 GB hard drive, good for storing and streaming dozens of HD-quality movies, it’s also much larger and heavier than the AirStash (think the size of a hardback book rather than a Zippo lighter). At $200, it’s also more expensive. Then again, the new AirStash isn’t exactly cheap, especially considering that the $149 model only comes with an 8 GB memory card. The AirStash works with removable SD memory cards, and you can plug it into a PC or Mac via USB. Still, the AirStash performed admirably in my tests. I managed to stream video from the AirStash for more than seven hours before the drive’s rechargable battery ran out of juice, and I was also able to wander from one end of my apartment to the other without interrupting the AirStash’s wireless connection. The second-generaton AirStash also supports the latest Wi-Fi standard (802.11n, to be specific) for speedy wireless transfers. But while you can password-protect the wireless link between the AirStash and your handheld, you’ll have to use the relatively weak WEP security system. (Think of it as a latch on a screen door rather than a bank vault.) The makers of AirStash promise that stronger WPA protection will arrive in a future software update. Overall, I’d say AirStash makes for a great way to wirelessly share videos, music, and photos with smartphones and tablets, especially when it comes to devices like the iPad that lack slots for removable memory cards. But at $149 and up, the new AirStash is a bit too pricey for the memory you get (and no, there isn’t a cheaper model without a bundled SD card). personally, I’d wait until the price tag falls back down to about $99, same as the original AirStash. Any questions about the AirStash A02? Let me know! Note: Maxell loaned me an AirStash A02 for review, and I plan on shipping it back once I’m finished testing.